Lenovo-owned Motorola went in a completely different direction for its flagship phones this year. The revamped Moto Z family’s styling eschews tradition and higher prices with better-performing hardware push the Moto Z Droid and Moto Z Force Droid further into flagship territory than previous models (the Moto Z Play Droid falls into the midrange category). The biggest change, however, is Motorola’s move to modularity. We’ve been hearing promises of modular smartphones for a while, but it only became a reality this year—first with LG’s G5 and then the Moto Zs. Modules allow us to add specialized or situation specific capabilities to our phones such as a larger battery when traveling, additional sensors for monitoring your health, or a more-powerful speaker for listening to music with friends. And by splitting off hardware into separate modules, the base cost of the phone can be reduced, freeing us from paying for features we do not use—at least in theory. Motorola’s Moto Mod platform is well executed, but I’m still not sold on the modular concept. What makes smartphones so powerful and portable are tight hardware integration and the ability to wirelessly connect to other devices and networks. Splitting hardware off into a separate module with its own packaging considerations or attaching what’s normally an external accessory, such as a Bluetooth speaker, onto the phone negates both of these advantages, resulting in something that’s bigger, heavier, and possibly more expensive. 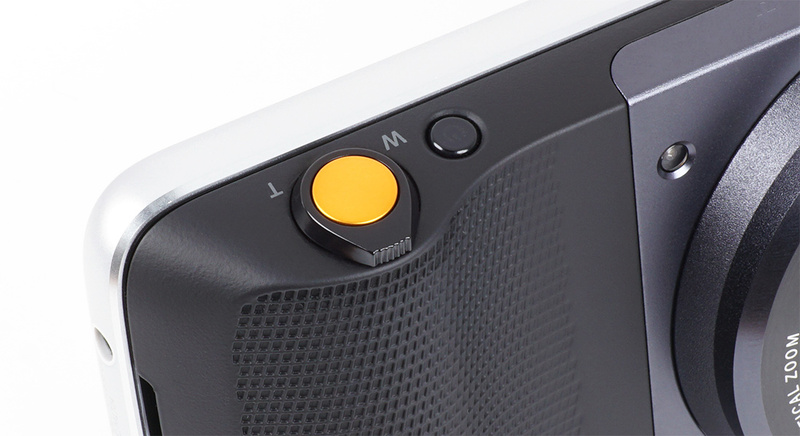 It does not help that the existing Moto Mods—the JBL SoundBoost speaker and the Moto Insta-Share projector—are not particularly compelling either, although the Power Packs are useful for increasing battery life. So why does the Hasselblad True Zoom Mod exist? What problem does it solve? Why should you pay extra money for a camera module that covers up the phone’s integrated rear camera that you already paid for? 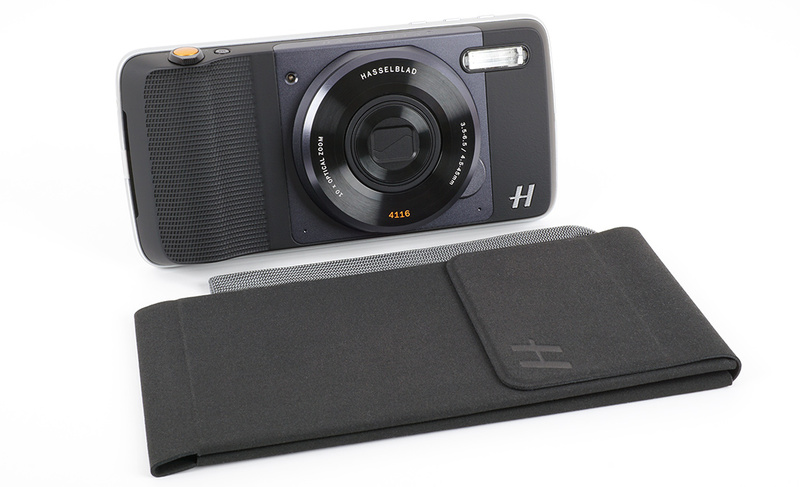 Well, like LG’s CAM Plus module for the G5, the Hasselblad True Zoom Mod provides a traditional grip that transforms the look and feel of the phone into something similar to a point-and-shoot camera. It also adds physical controls for basic camera functions, making it easier to use, especially one-handed, which is actually possible thanks to the aforementioned camera grip. These ergonomic improvements are certainly welcome—snapping a picture with a large, slippery phone can be tricky—but this module’s raison d'être is 10x optical zoom. With the exception of a few specialty phones, such as the ASUS ZenFone Zoom (3x optical), smartphone cameras come with fixed lenses, a necessary concession to keep chassis thin and costs down. Without the ability to change focal length, smartphone cameras can only offer digital zoom, which is merely an illusion achieved by cropping the image and applying some post-processing to clean up the image a bit. This significantly degrades image quality by effectively reducing the final image’s resolution. Optical zoom, however, maintains detail and sharpness by physically moving the lens, thereby changing the focal length and magnifying the scene. 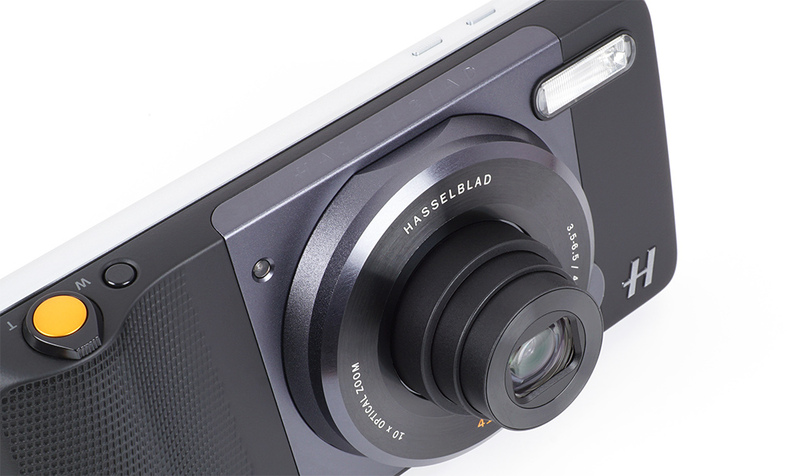 In the case of the Hasselblad True Zoom Mod, the improvement is quite dramatic. 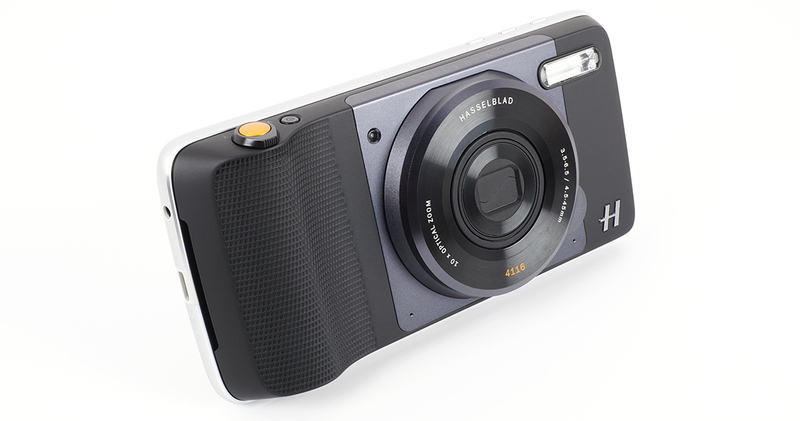 Unlike LG’s CAM Plus, which just adds a grip, physical controls, and a larger battery to the G5’s existing rear camera, the Hasselblad True Zoom Mod is a complete camera replacement. In addition to the Moto Mod connector’s exposed gold pins, the back of the True Zoom has a foam-cushioned circular recess that fits over and protects the Moto Z’s raised camera module, which also helps keep the True Zoom from sliding off. The True Zoom easily attaches to the back of the phone with strong magnets. The connection is quite secure, so it’s good that there’s a recess on one end to get a finger under for prying it off. 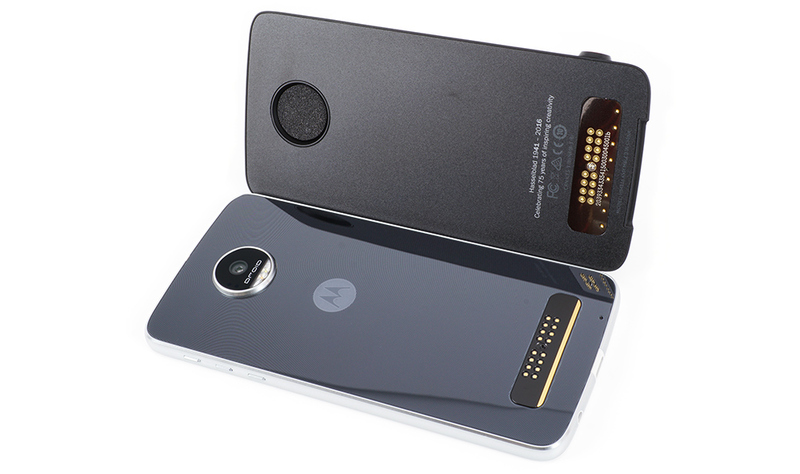 One of the advantages of the Moto Mod system is that the modules are hot-swappable and do not require rebooting the phone or messing with settings. Once the True Zoom snaps into place, the phone makes an audible alert and a small vibration confirming it’s attached. Motorola’s camera app includes a few options specific to the True Zoom, such as special modes for sports, portraits, and landscape shots, but the camera works with third-party apps too just like the Moto Z’s integrated camera. The front of the True Zoom looks just like a point-and-shoot camera with a zoom lens that extends from a raised plastic ring. The lens retracts into the body and sits flush with the ring when the camera is powered off and a plastic door closes to protect the lens. The motor that operates the lens makes an audible noise, but it’s not loud enough to bother me. Just below and to either side of the raised ring are two microphones, and there’s an orange focus assist LED above, which definitely helps AF performance in low-light conditions. There’s also a bright Xenon flash in the upper corner that’s similar to what’s found on small cameras. The plastic module has a textured grip on the right side (sorry lefties) with a rubberized coating that extends around the edges and most of the front that makes it pretty easy to hold, although the grip is undersized for larger hands. 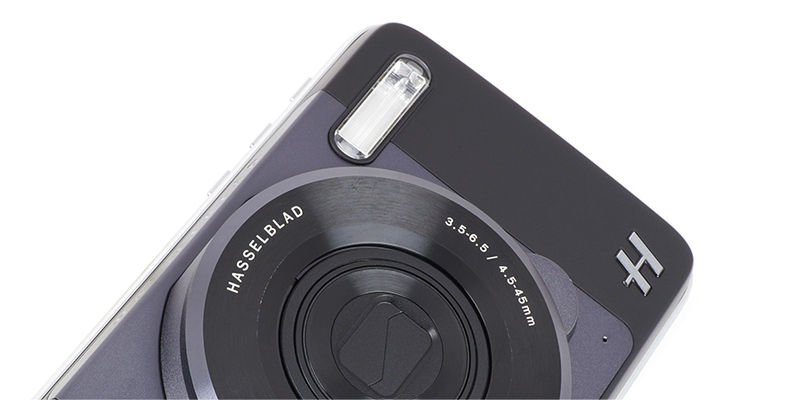 There’s a physical shutter button on the top that can be pressed halfway for exposure and focus lock. This button is surrounded by a plastic dial for controlling the zoom level, which is the only part of the module that feels cheap and flimsy. Next to the shutter button is a small power button that wakes the phone, opens the camera app, and turns on the camera, extending the lens when pressed. Pressing it again turns off the camera, closes the camera app, and leaves you at the home screen rather than turning off the phone too. Opening or closing the camera app also turns the True Zoom on and off automatically, so you do not always need to use the button. The True Zoom is between 9mm and 15mm thick. Snapping it onto the Moto Z Play Droid or Moto Z Force Droid brings the total thickness to 16mm/22mm or a slightly slimmer 14.2mm/20.2mm on the Moto Z Droid. This is in the same range as dedicated compact cameras with zoom lenses and 1/2.3” format sensors, so there’s no thickness penalty associated with using the True Zoom module. It’s still compact enough to slide into a pocket or the soft-touch carrying case with magnetic flap that comes with the True Zoom. Because the smartphones the True Zoom attaches to carry a larger battery and a lot more hardware inside than a compact camera, there is a size and weight penalty for the modular approach. The True Zoom weighs in at 145 grams, which is right around the average weight for comparable compact camera; however, once it’s attached to one of the Moto Zs, the total package weight increases to 281-310 grams, about twice as much as a dedicated camera. This weight is still manageable, but you’re going to feel it sitting your pocket. Keeping the True Zoom attached also compromises the smartphone experience. There’s the obvious issue of the phone being noticeably heavier—the arm gets tired quickly holding the phone to an ear—and the raised ring around the camera is less comfortable in the palm of your hand than the usual smooth, curved back of a phone. For short stints it’s not a big deal, but if the camera will not be used for a while, it’s best to pop it off and put it away. 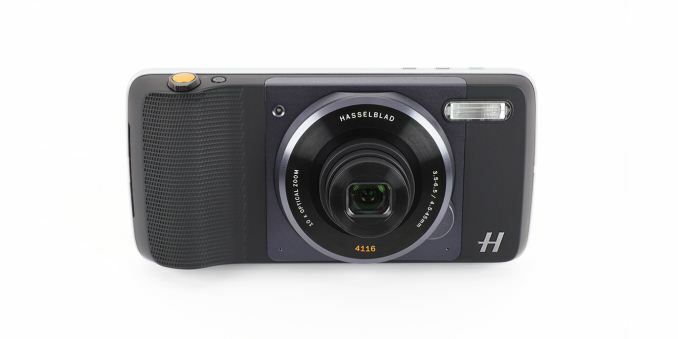 The Hasselblad True Zoom Mod both looks and functions like a compact camera. The tradeoffs for a modular design are manageable considering the additional features it provides. It has an attractive design, and is well integrated with the Moto Z’s software, making it feel like it belongs on the phone rather than a piece slapped on the back.